As I've mentioned a time or two in the past, macaroni and cheese is definitely up there on my list of favorite foods. In my mind, it's pretty much the perfect comfort food. While I definitely have a favorite traditional mac and cheese recipe, I also like to experiment with variations. 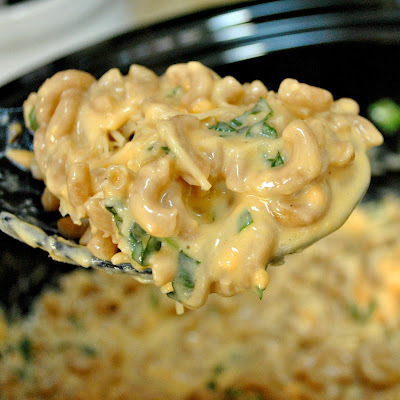 Check out these other macaroni recipes I've posted previously - Spicy Crab Macaroni and Cheese, Baked Mac and Cheese, Stovetop Mac and Cheese, and this chicken version - White Cheddar Chicken Pasta. Well when I saw this beer cheese soup turned mac and cheese recipe on Pinterest, I couldn't pass it up. I figured it would be perfect for our tailgating party for the upcoming game. Let me tell you, don't wait to make this one. This is some fantastic pasta. The beer combines perfectly with the smoked and sharp cheddar cheeses and whole wheat pasta. I used a Sam Adams Oktoberfest beer but any decent beer should work, I think I would avoid the light beers for this recipe, as you want something with a bit more flavor. Feel free to adjust the cheeses but I think the blend of 1/3 smoked cheddar, 1/3 sharp white cheddar, and 1/3 mild cheddar, along with a little American cheese gives great flavor. I added the American cheese slices because I like the creaminess that it adds. I just used slices from the deli but you could shred it as well. The recipe that I used baked the mac and cheese but I opted not too for this one since it was so creamy straight from the stovetop. If you want to bake it, I recommend adding a bread crumb topping. Meanwhile, melt butter in a saucepan over medium heat. Add flour and whisk to make a roux. Continue whisking until the roux start to turn golden and bubbles, about two minutes. Add milk and beer, stirring constantly. Cook for about five minutes until the mixture begins to thicken slightly. Reduce heat to low and add cheeses by the handful, stirring to melt and incorporate. The sauce will thicken slightly but will not be as thick as regular mac and cheese at this point. Add paprika, mustard, thyme, and salt and pepper to taste. Pour sauce over pasta and stir to distribute. Chiffonade basil leaves by stacking and rolling tightly, then use a sharp knife to cut thin slices to form ribbons. Stir basil into pasta and serve. Just saw this on pinterest and immediately came over! I love a good cheesy mac and cheese, and I love that it has beer in it. Made this tonight. Loved it! Thanks! @jessutopia -- glad you liked it! I love Mac & Cheese and Oktoberfest. Will definitely be trying this week. This looks fantastic--I pinned and had to come over. I will totally be making it this weekend. I think I gained 10 pounds just READING your blog! You have AWESOME looking recipies. I'm pinning this one too.... Thanks so much for sharing all of your cheesy yumminess! I can't find smoked cheddar anywhere! Do you have a suggestion for a substitute? You can use regular cheddar or a smoked Gouda or mozzarella would also be good. Really good if you like smokey cheese! this sounds soooo yummy! Can't wait to try it! I just made this. It's sitting here fresh & ready to serve. Only has a funny texture. Like a sort of soft grittiness. I'm not sure you did anything wrong, Melissa. Looking at the picture, it seems that, at the bottom of the spoon, there might be some grittiness. This can happen when there's hard cheeses, as they don't melt as smoothly. 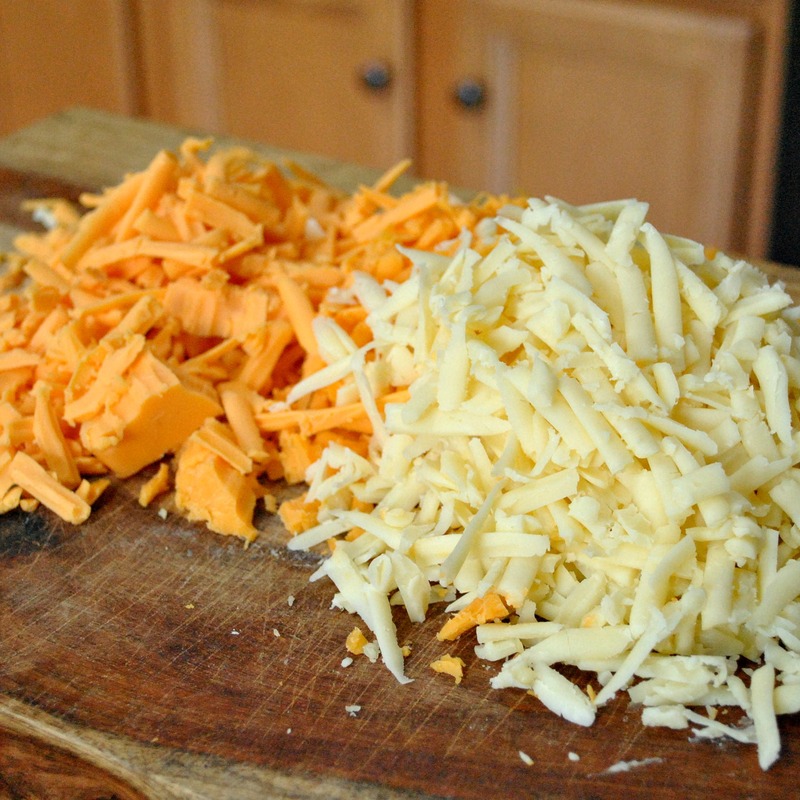 Also, if you used packaged cheddar cheese, there's often cellulose to prevent caking. That can also cause grittiness, but it won't really hurt your sauce. There is sometimes a possibility of the heat being too high when you made your roux and started adding the milk, but, again, after looking at the photo, I don't think you did anything wrong. Melissa - I'm sorry I'm just seeing this comment. I agree with the advice the above poster offered although mine wasn't gritty but it's happened to me before when making mac and cheese. Many times a slightly gritty texture can be the result of the heat being too high when you add the milk - this is especially true if you used a lower fat milk like skim or 1%. I also have better results, both flavor and texture with grating cheese from a block rather than using pre-shredded cheese because of the additives. Excellent recipe! I know everyone likes to add their own touch so we used a honey wheat beer and added bacon bits. Looking forward to the leftovers! This was amazing. So glad I found it on Pinterest. It was super easy too. I went with a local beer and used Great Lakes Brewing Company Oktoberfest. It was delicious. At the end topped it with some chopped up hot peppers. I really look forward to trying this again and experimenting with different beers for it. I made this the other night, and it was so good! used a few different cheeses-a four year aged cheddar from Metropolitan Market, a gouda and cheddar. I think I used a little more paprika than asked for, but man, oh man! This was so good! I'm having the leftovers today for lunch. Don't know what I'm going to do for beer next time, had to search high and low for Oktoberfest! Nice! used new castle beer, added italian sausage to make complete meal. It makes a good size crock pot full, I would say 6-8 servings easily. Thanks for the recipe! I will be trying it this week!! I love Mac and Cheese and also love beer cheese soup so I am assuming this will be delicious! I made this for dinner tonight. I added roasted poblano peppers and some cilantro instead of basil! Was pretty tasty.